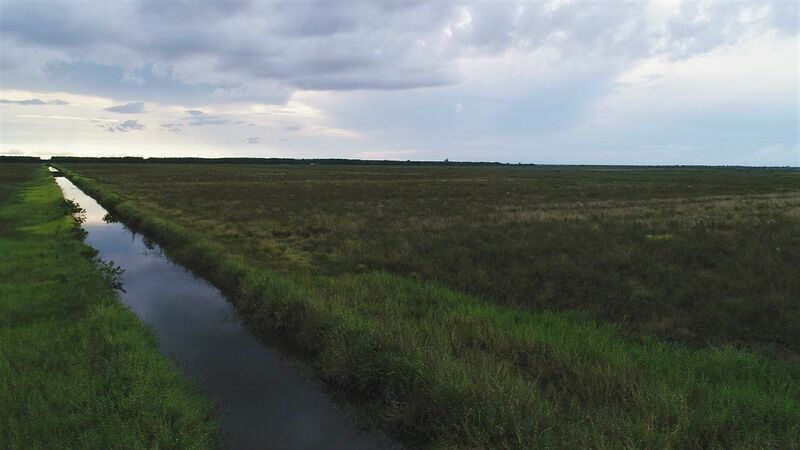 Incredibly rare opportunity to own 2,900 contiguous acres m/l of productive land with endless potential near Florida’s eastern coast. 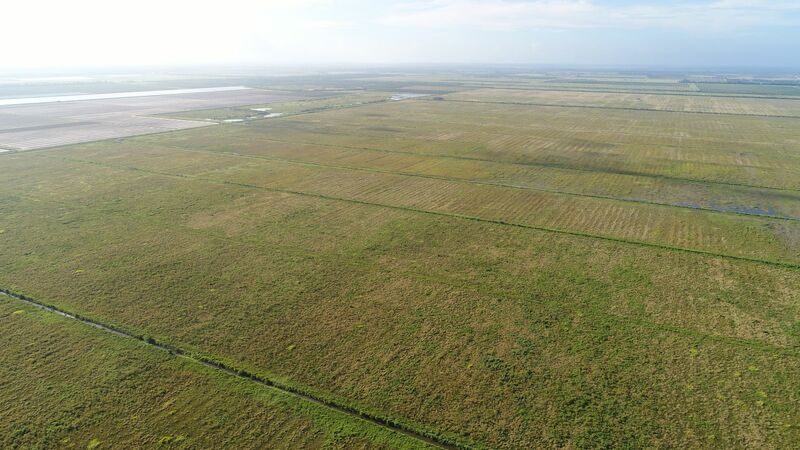 This former citrus grove property has approximately 2,000 acres that have been cleared and precision leveled with engineered internal ditching, all of which is currently in fallow allowing immediate preparation to plant the next crop. 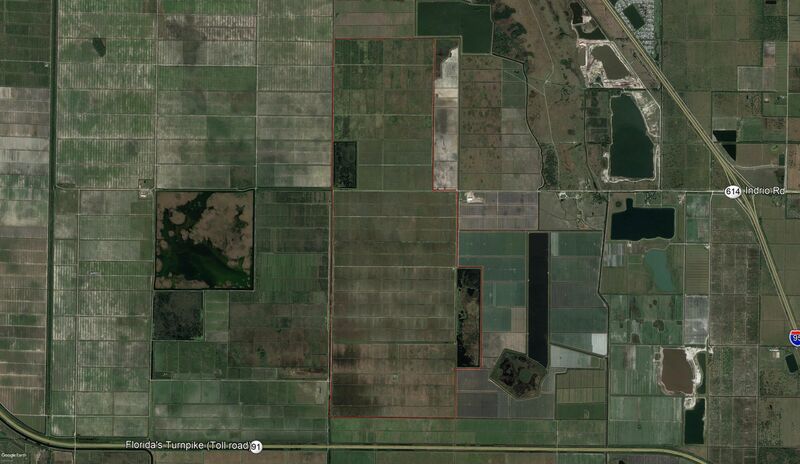 An additional 640 acres m/l on the north end are citrus groves in various stages of clearing. 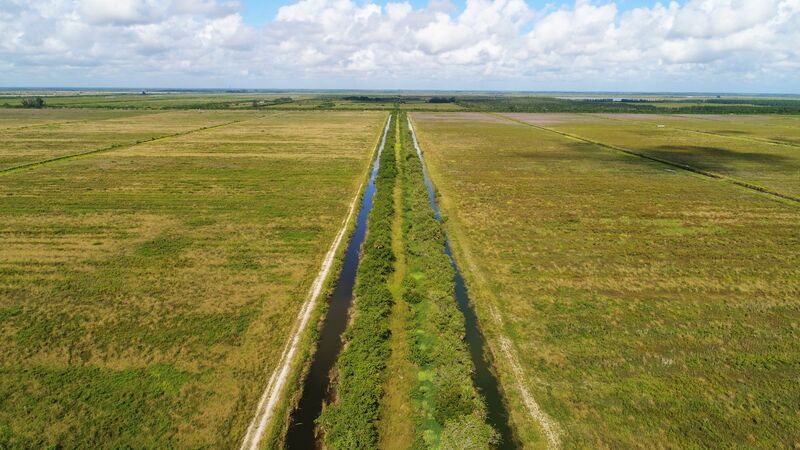 The property consists of 2,652.97 acres considered cropland by the St. Lucie County FSA Office, of which 80 acres m/l is currently utilized as a reservoir and approximately 2,325 acres are net tillable land. Multiple water sources include a canal along the western boundary, two reservoirs, as well as permitted and surface wells. In addition to extensive irrigation improvements, the property has been developed to assure rapid drainage in the event of excess rainfall. 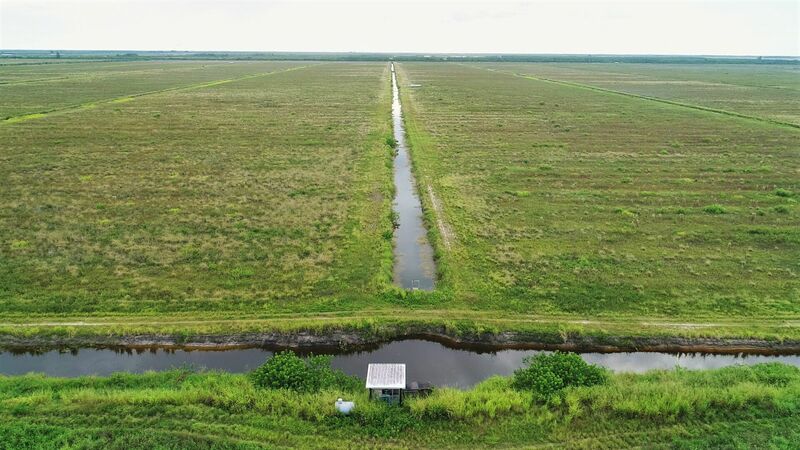 On top of the future development potential for both residential and solar fields, the location just 3 miles from I-95 and ¼ mile from Florida’s Turnpike between the Atlantic Ocean and Lake Okeechobee provides this property the perfect climate and access for multiple crop varieties including row crops such as corn and soybeans, vegetable production, and citrus groves. From I-95 Exit #138 travel west on Indrio Road for 3 miles. Property will be located on both sides of the road. 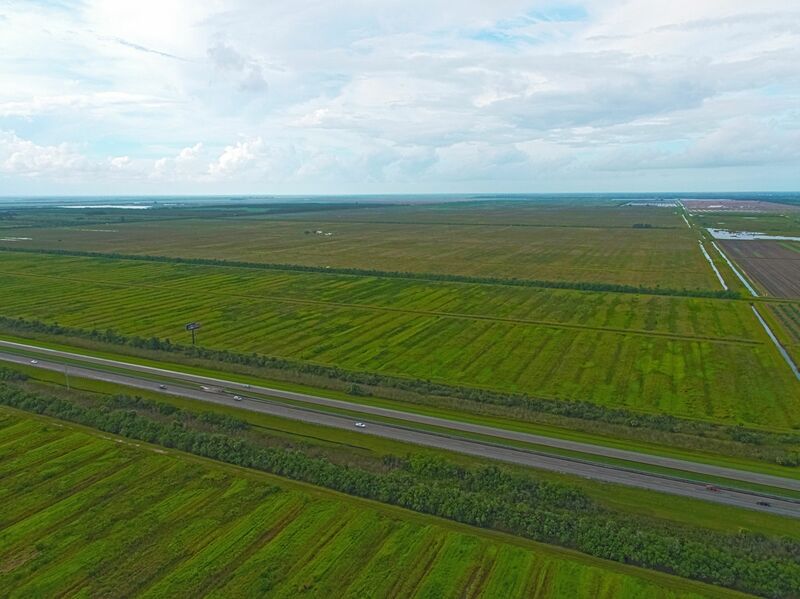 Current Land Status: Approximately 2,000 acres have been cleared precision leveled to a 1/10th grade with irrigation/drainage systems and engineered ditching throughout. 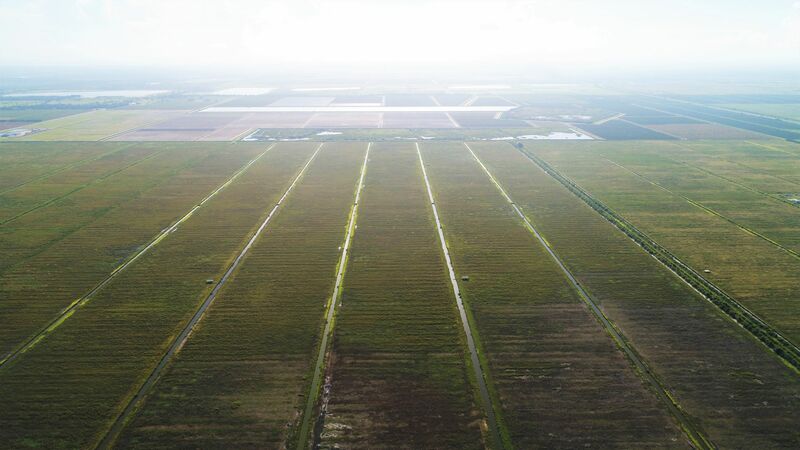 Approximately 1,760 acres on the south side of Indrio Road have furrow irrigation systems in place. 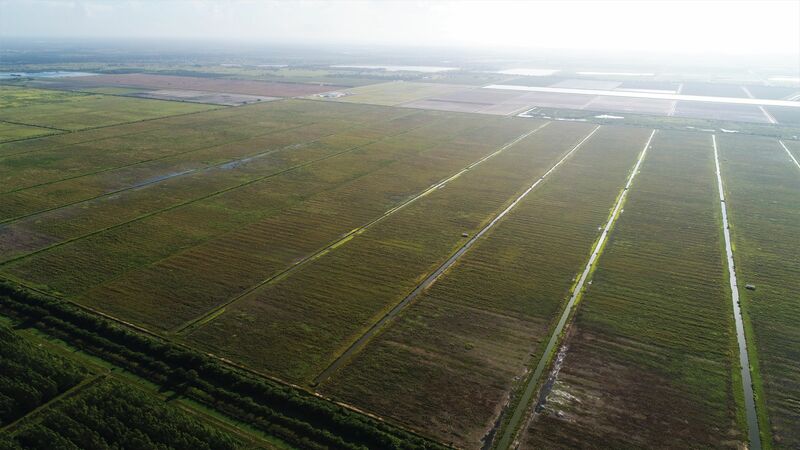 The 240 acre m/l on the north side of Indrio Road that have been cleared and leveled are ideal for linear or gravity irrigation. An additional 640 acres m/l along the norther edge of the property is in various stages of clearing. Water Overview: The availability and control of water at minimal cost is another unique feature of this property. Water resources include reservoirs, permitted wells, and a canal. Control features include engineered ditches and pumping systems allowing water holding within the property for draught periods or quick removal in heavy rain conditions. The canal along the western boundary does not fall into a water management district. 1. 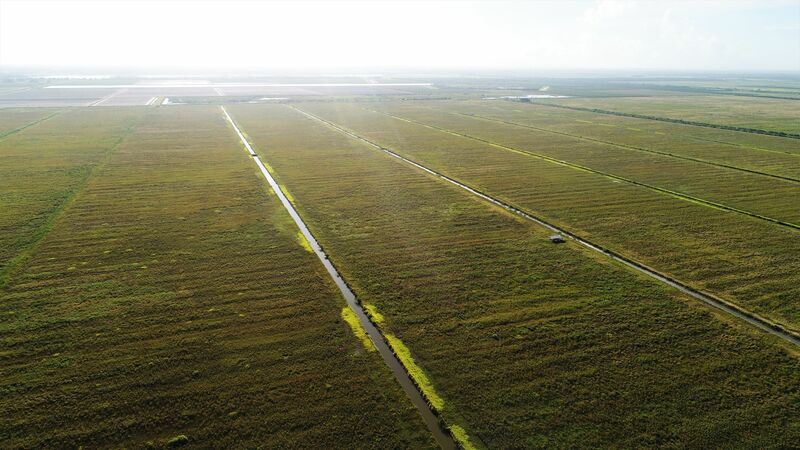 Two reservoirs totaling 240 acres m/l which hold fresh water to irrigate the property. 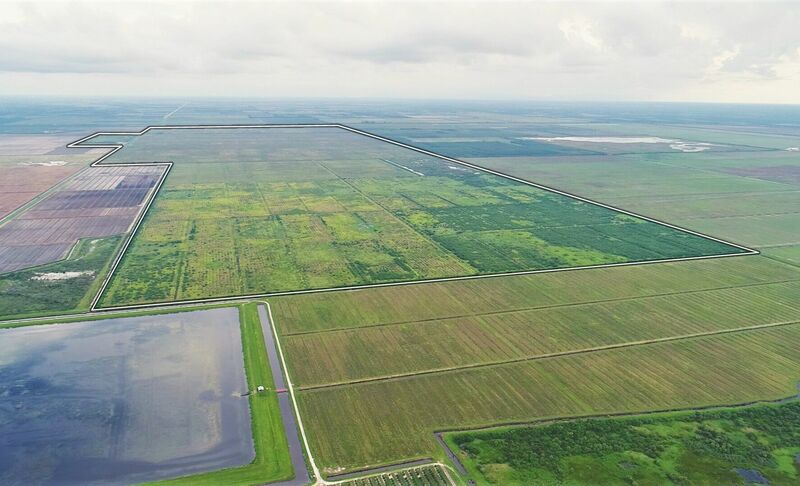 The 80 acre reservoir is located north of Indrio Road along the western boundary while the 160 acre reservoir is conveniently located along the eastern central boundary of the portion of land south of Indrio Road. 2. 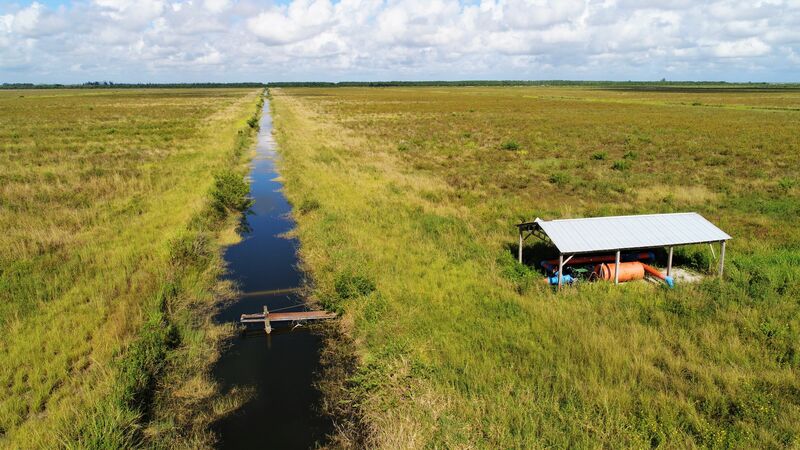 Canal located along the entire western boundary with multiple pumps to facilitate the removal of water off or on to the property. 3. 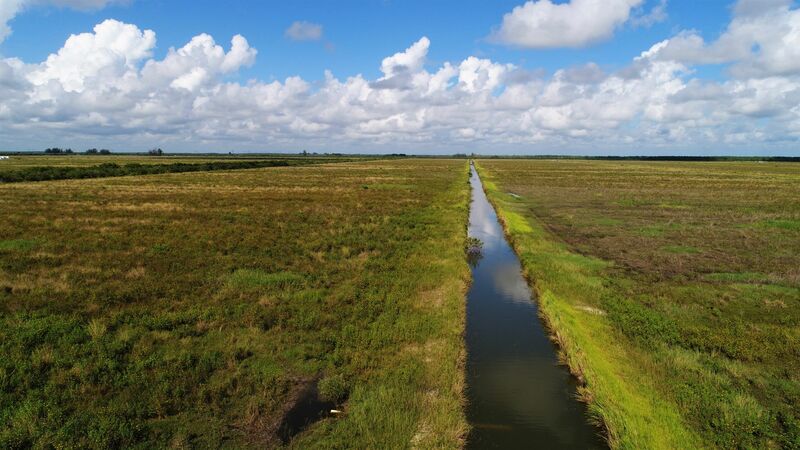 Internal ditches situated throughout the property are set up to work in conjunction with the reservoirs and canal to ensure quick water removal and ample sources for irrigation. 4. Eight permitted wells ranging from 6 to 12 inches along with two surface wells are also available to add irrigation potential in draught conditions. All bidding will take place through Peoples Company’s Online Only bidding platform. There is a minimum starting bid of $16,375,000 with all additional bids to take place in $100,000 increments. A 2% Buyer’s Premium will be added to total purchase price. A bid placed within 10 minutes of the scheduled close of the auction will extend bidding by 10 minutes until all bidding is completed. If you plan to bid, please register 24 hours prior to close of auction. Under no circumstances shall Bidder have any kind of claim against Peoples Company or its affiliates if the Internet service fails to work correctly before or during the auction. 1. NOTICE. The Property is property of the Debtors’ bankruptcy estates, and the terms and conditions of the online Auction sale and online bidding procedures, the sale of the Property, as well as the form of sale contract are expressly subject to the approval of the U.S. Bankruptcy Court for the Southern District of Florida. According to the requirements set forth in Section 363 of the United States Bankruptcy Code and applicable rules, Seller: (i) will consider any higher and better purchase offers that may be presented to Seller up until the final hearing to approve any proposed sale which will take place in the Bankruptcy Court; and (ii) must provide satisfactory notice of the proposed sale and its terms to all creditors and interested parties, after which the Bankruptcy Court will hold the final hearing to approve the proposed sale, shortly after the end of the Auction. The information provided represents the extent of the information available to/from Seller. Bidder understands the Offering Memorandum contains selected information pertaining to the Property and does not purport to contain all of the data a prospective purchaser may desire. Bidder expressly agrees to conduct, at their own risk, their own independent inspections, investigations, inquiries, and due diligence concerning the Property to verify the accuracy and completeness of any and all information obtained from the Offering Memorandum. Bidder hereby acknowledges that neither the Seller, Debtors, Debtors’ bankruptcy estates, nor any person acting on the Seller’s behalf, has made any representations or warranties, express or implied, of any kind, nature, or description, as to the accuracy or completeness of this information or their contents, or the suitability of the information contained therein for any purpose. At any time, this information is subject to, among other things, correction of errors and omissions, addition or deletion of terms, change of terms, withdrawal of Property from market without notice, and prior sale. Each potential Bidder shall be liable for any property damage and/or any personal injuries (including death) caused by or arising from any such inspection or investigations by them or their employees, agents, contractors, or consultants, and prior to any on-site inspection or investigations, will be required to execute a release and waiver of liability in favor of Seller. This information has been obtained from sources believed reliable. While we do not doubt its accuracy, we have not verified it and Seller makes no guarantees, warranties, or representations about it. Again, it is your responsibility to independently confirm its accuracy and completeness. You and your advisors should conduct a careful, independent investigation of the Property to determine to your satisfaction the suitability of the Property for your needs. Seller and Peoples Company may supplement, revise, or add property information up to the time that the Auction ends. Potential Bidders should continue to monitor PeoplesCompany.com to ensure they are aware of the most up-to-date information. 2. SELLER INTENT. Seller’s intent is to obtain the highest value for the Property. (4) fully disclose and identify each person and/or entity that will be participating in the Bid, so that Seller may determine that the Bidders are submitting a Bid in good faith, on an arm’s length basis, including that Bidders are not an affiliate of nor otherwise related to Debtors, Kevin Bynum Farms, LLC, and R.D. Grove Enterprises, Inc., or to the Seller, Nicole Testa Mehdipour, Trustee. In order to participate in the Auction, all Bids must comply with items 1 through 4. If a Bid complies with these requirements, Peoples Company and/or Seller will notify Bidders that their Bid is a “Qualified Bid”, and that Bidder will be permitted to participate in the Auction. If there is more than one Qualified Bid submitted, then the Auction will be held online at PeoplesCompany.com, and any Bidders with Qualified Bids will be able to raise their Qualified Bids online. During the Auction, bidding will open and start at the Reserve Price, or $16,375,000.00. Bidding above the Reserve Price will increase by increments of One Hundred Thousand dollars ($100,000.00). Bidding will continue until the online Auction ends, unless a Bidder raises its Qualified Bid at the end of the auction, in which case the Auction closing time will be extended by ten (10) minutes to permit any other Bidder with an opportunity to raise its Qualified Bid, and which ten (10) minute extensions of the closing time will continue until there are no more Qualified Bids submitted. Immediately after the Auction closes, the Seller, in her discretion will select the highest and/or otherwise best Qualified Bid as the “Winning Bid”, and the Bidder with the Winning Bid will be the “Successful Bidder”. The Winning Bid may or may not be the highest Bid submitted. The Successful Bidder will be solely responsible for paying the Buyer’s Premium of two percent (2%) of the gross amount of the Winning Bid. The Successful Bidder will be promptly notified, and Seller will request final approval from the U.S. Bankruptcy Court of the Successful Bidder (which approval will be requested on or around November 7, 2018). After Court approval, the Successful Bidder will be bound by a form of non-contingency, all-cash contract (substantially similar to that provided in the bidder’s packet), with no post-Auction due diligence period, and by no later than 5:00 p.m. (EST) on the same date that the Court approves the sale, the Successful Bidder will be required to deposit with the Closing Agent an additional amount in readily available funds that when added to the Bid Deposit, will be equal to a total of ten (10%) percent of the Winning Bid plus the Buyer’s Premium, or the “Total Payment”. Also after the Auction closes, the Seller, in her discretion, will select and notify the next highest and/or otherwise best consenting Qualified Bid (who will advise Peoples Company of whether or not it will consent to be the Back-Up Bidder, at the same time that Bidder submits the documents or information required to participate in the Auction, or items 1 through 4, above) that it will be the Back-Up Bidder. The Back-Up Bidder will also be bound by the form of non-contingency, all-cash contract (substantially similar to that provided in the bidder’s packet), with no post-Auction due diligence period, and by no later than 5:00 p.m. (EST) on the same date that the Court approves the sale, will also be required to deposit with the Closing Agent an additional amount in readily available funds that when added to the Bid Deposit, will be equal to a total of ten (10%) percent of the Back-Up Bid plus the Buyer’s Premium, or Total Payment. The Back-Up Bidder will be obligated to close on the sale of the Property within five (5) calendar days’ written notice from Seller of the Successful Bidder’s failure to close, and the Back-Up Bidder will then become the Successful Bidder. However, this will not impact or modify the Closing deadline of November 30, 2018, as set forth in paragraph 8. Any other Bidders with a Qualified Bid who participate in the Auction Sale, but are not the Successful Bidder or the Back-Up Bidder will receive their Bid Deposits back within three (3) business days after the Auction Sale ends. Attn: Nicole Testa Mehdipour, Esq. 4. TITLE TO PROPERTY. Seller will convey good, marketable and insurable fee simple title to the Property to the Successful Bidder free and clear of all liens and encumbrances, subject only to title exceptions as set forth in the Real Estate Purchase and Sale Agreement. Within seven (7) days before closing on the executed Contract, Seller will, at Buyer’s expense, furnish a commitment to issue an ALTA title insurance policy, including the minimum standard detail requirements and the optional items it elects to provide from Table A, in the amount of the Winning Bid. Seller will provide Buyer with a copy of such title commitment and all associated documentation promptly upon receipt. If Buyer desires further survey information, Buyer shall be responsible for all costs. (i) current city, state and county ad valorem and property taxes not yet due and payable for the year of closing and subsequent years; (ii) easements for the installation or maintenance of public utilities serving only the Land; (iii) any easement, right-of-way or reservations of record or other Permitted Exceptions, (iv) comprehensive land use plans, zoning, restrictions, prohibitions and other requirements imposed by a governmental authority; restrictions and matters appearing on the plat or otherwise common to the subdivision; outstanding oil, gas and mineral rights of record without right of entry; unplatted utility easements of record; so long as no violation of the foregoing exists at the time of closing, and (v) and/or any specific title exceptions as may be discovered. Title to Personal Property shall transfer by Bill of Sale, if applicable, but subject to any terms that may be set forth in the Contract, and in a form that will be prepared by Seller. 5. LEASES. All leases on the Property have been terminated and the land will be made available upon closing. 6. FARM PROGRAM INFORMATION. 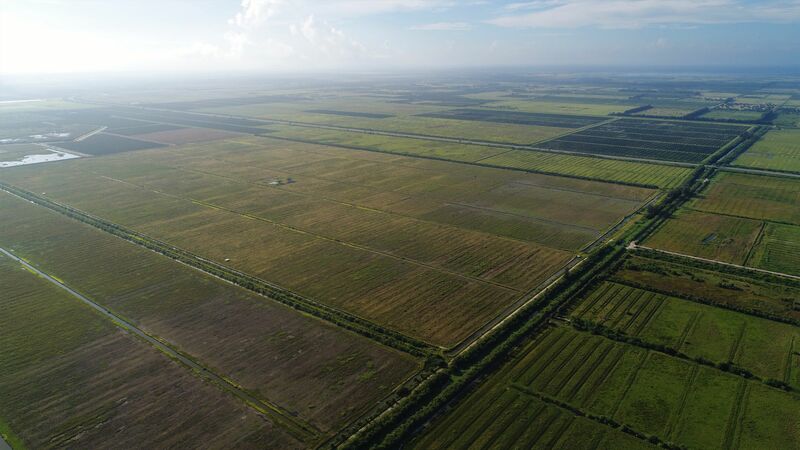 The Farm Program Information is provided by the Saint Lucie County, Florida Farm Service Agency & Natural Resources Conservation. 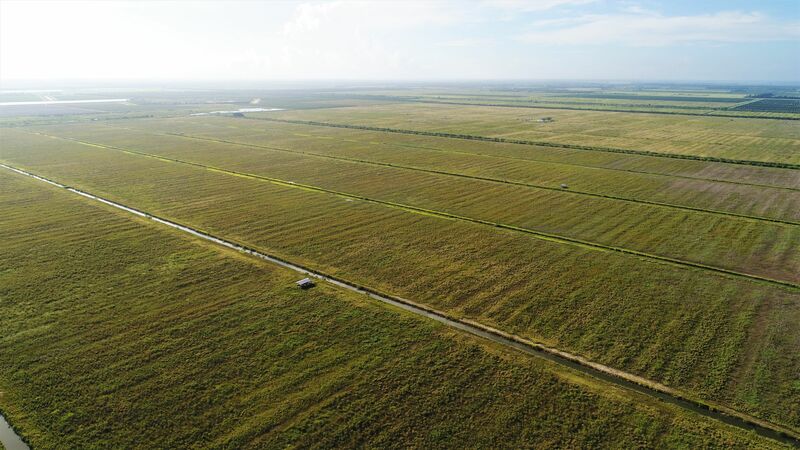 The figures stated in the marketing material reflects the best knowledge of the Seller and Peoples Company; however, Farm Program Information such as base acres, cropland acres, etc. 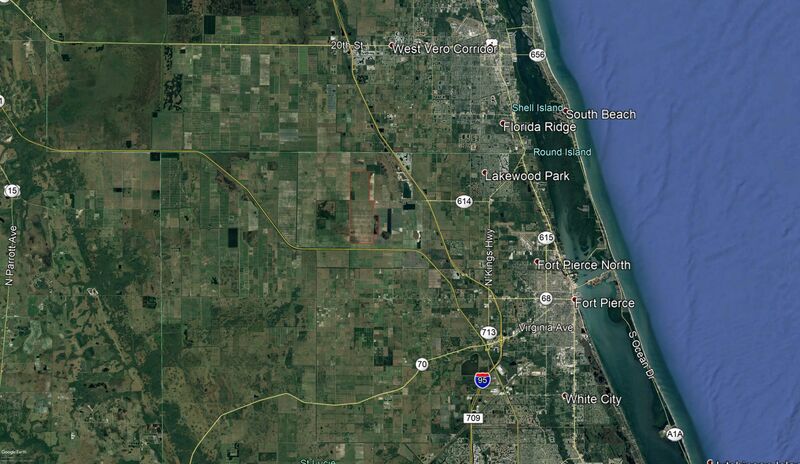 are subject to change if/when the land is reconstituted by the Saint Lucie County Farm Service Agency. 7. SURVEY. Bidders may, at their option, secure a survey of the Property at Bidder’s sole cost and expense. A plat of such survey must be delivered to Seller no later than seven (7) days prior to Closing (which survey must contain the surveyor’s certification, to both Seller and Buyer, of acreage so determined). Purchase Price will not change based on survey. 8. CLOSING DATE, POSSESSION, AND FINAL PAYMENT. Closing will take place through Seller’s designated Closing Agent within fifteen (15) days after final approval of the sale of the Property to the Successful Bidder(s) by the U.S. Bankruptcy Court, or at such date as may be mutually agreed to writing between the parties, but will take place no later than November 30, 2018. Seller reserves the right to make changes to any sale documents (e.g. contract, addenda, deed(s), agreements, etc.) to the extent of (1) filling in of blank sections, (2) attachment of appropriate exhibits, and (3) any necessary or desirable changes due to Seller’s legal counsel, or as may be ordered by the Bankruptcy Court. Possession of the Property will be given at Closing. At least three (3) business days before the Closing date, Successful Bidder must remit the remaining unpaid balance of the Total Payment, including the Buyer’s Premium, to the Seller in the form of cash, guaranteed check or wire transfer, so long as the unpaid balance is timely received by Seller at least three (3) business days before Closing. Seller will provide wire transfer instructions upon request. The Back-Up Bidder’s earnest money deposits will be refunded within three (3) business days after a Closing with the Successful Bidder. 9. CLOSING EXPENSES AND PRORATIONS. The Successful Bidder shall pay any owner’s title insurance or lender’s title insurance policy and related charges (e.g., endorsements and search fees), without reducing the Total Payment payable before Closing. Further, Successful Bidder is also responsible for paying for: any additional title insurance coverage or endorsements requested by Successful Bidder or its lender; evidence of title; survey; all taxes and recording fees on notes, mortgages and financing statements; all applicable use/sales taxes on the Personal Property (if any); recording fees, and documentary stamp taxes for deed(s); the Buyer’s Premium; as well as its own attorney’s fees. Seller shall pay Seller’s attorneys’ fees, and recording fees for any documents needed to cure any title defects (if any). All real estate taxes accruing through the date of closing will be prorated as of the day before Closing and will be paid in full by Seller, as a credit to Successful Bidder at Closing. However, all real estate taxes accruing after the date of Closing, and for subsequent years will be the responsibility of the Successful Bidder. 10. DEFAULT AND REMEDIES. In the event that this transaction fails to close on account of a default by Seller under this Agreement, Successful Bidder’s sole and exclusive remedy will be the return of the Bid Deposit and/or any additional deposits submitted, with Successful Bidder thereby waiving any other remedy that Successful Bidder may have against the Seller at law or in equity, including without limitation the right to specific performance. In the event that this transaction fails to close on account of a default by Successful Bidder under this Agreement, Seller’s remedy will be to retain the Bid Deposit as liquidated damages and consideration for executing the contract. 11. GOVERNING LAW. The form of Contract and any other sale documents to be executed by Seller and Successful Bidder, as well as Back-Up Bidder, shall be governed by and constructed in accordance with the laws of the State of Florida. 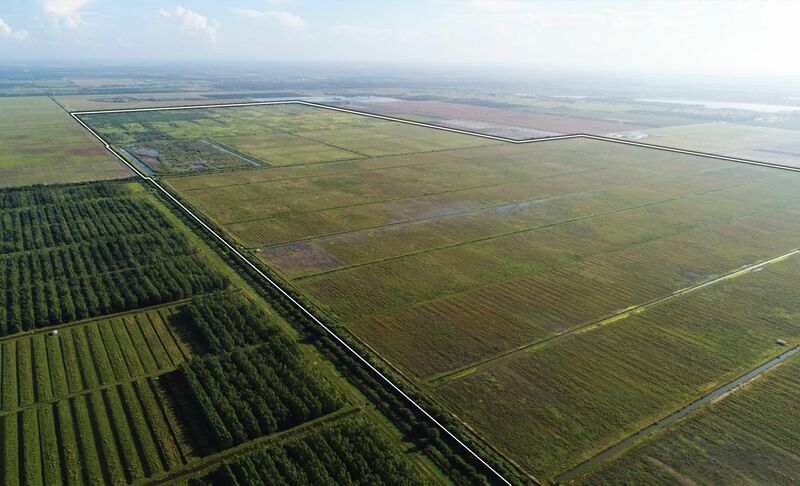 Any and all disputes relating to the sale, Contract and any other sale documents, or any other documents shall be heard by the U.S. Bankruptcy Court for the Southern District of Florida. 12. DISCLAIMER. All information contained here and all related materials are subject to the terms and conditions outlined in the form of Contract, and the terms of the Bidding Procedures Order as approved by the Bankruptcy Court. In the event of any conflict between the terms and conditions in this memo and the terms of the Bidding Procedures Order, the terms of the Bidding Procedures Order will govern. Except as set forth in this Agreement, Successful Bidder acknowledges, and represents and warrants to Seller, that Successful Bidder has assessed, or has had the opportunity to assess, the size, configuration, utility service, environmentally sensitive areas, means of access, permitted uses, status of title (including, but not limited to, all easements, rights of way, covenants, conditions and restrictions, reservation of rights, and other encumbrances and restrictions affecting the Real Property or any portion thereof), value, condition (including, but not limited to, the physical and environmental condition of the Real Property), water rights, irrigation and water systems, and all other material aspects of the Real Property and the Personal Property, and, except as specifically stated herein, Successful Bidder is not relying on, nor has Successful Bidder been influenced by, any statement or representation or warranty regarding the Real Property and the Personal Property and the satisfaction or waiver of all Successful Bidder’s conditions to closing will be evidenced solely by the Closing of this sale and without any other act or confirmation by Successful Bidder. SELLER HEREBY EXPRESSLY DISCLAIMS ANY AND ALL WARRANTIES OF HABITABILITY, MERCHANTABILITY AND FITNESS FOR PARTICULAR PURPOSE, EXPRESS OR IMPLIED. Successful Bidder does not have the option to close this transaction without accepting the Real Property and the Personal Property in its then current condition, and Successful Bidder acknowledges and agrees that Successful Bidder is acquiring the Real Property and the Personal Property “AS IS, WHERE IS, WITH ALL OF ITS FAULTS” in its current condition existing as of the Closing Date, without any representation, warranty, promise, covenant, agreement or guaranty of any kind or nature whatsoever by the Seller, whether express or implied, oral or written, past, present or future, of, as, to or concerning any aspect of the Real Property or the Personal Property including, but not limited to, the size, configuration, utility service, environmentally sensitive areas, means of access, permitted uses, status of title (including, but not limited to, all easements, rights of way, covenants, conditions and restrictions, reservation of rights, and other encumbrances and restrictions affecting the Real Property or any portion thereof), value, condition (including, but not limited to, the physical and environmental condition of the Real Property), water rights, irrigation and water systems, and all other material aspects of the Real Property and the Personal Property. 13. QUESTIONS. Any questions or comments related to the Property or the Auction or bidding process should be addressed to Peoples Company. By registering online and submitting a Bid, the Bidder expressly accepts the Terms and Conditions referenced above, and if Bidder’s offer is accepted, Bidder agrees to enter into a Contract (and/or any other sale documents) with Seller upon notification of its successful bid and/or back-up bid. A copy of Bidding Procedures Order will be available online, and a copy of the form of Contract to be executed by Seller and successful Bidder will be available upon request to review prior to bidding. These terms and conditions, and any terms of the form of Contract and/or the Bidding Procedures Order are not subject to negotiation. Use the 360 degree Interactive Tour to view the property from every angle. Click on the various vantage point icons to jump to different parts of the property. Click, hold, and drag to spin the camera in any direction.